For orders of quantity 15 or more please call in for pricing 888-931-1793. Two layers of gel coat provide for maximum UV resistance and color fastness. Continuous fibers that run throughout the Pad (including inside of the domes) make Ultra-ADA Pads the strongest and most durable pad on the market. 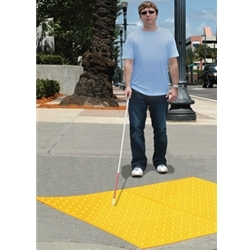 Flexible construction forms to fit dips, slopes and inclines in sidewalks and walkways. Installs quickly and easily using adhesive and anchors (included). stainless steel flat-head square drive screw.